Question for Alana: I work with the mentally ill in health care and I was wondering how I can better use my intuition to work with this population. My duties vary from helping people to understand the mind-body connection in their medical problem or healing from an injury, pain management, overcoming depression to working with someone with very severe illness such as schizophrenia. Alana’s Answer: Thank your for your sensitive and caring question! It is wonderful how your being has showed up in a health profession with such a deep intent to make a difference. By acknowledging your internal aspects that drew you to this vocation it feeds the ability to receive intuitive guidance. When we are in the act of appreciation we feed the essence of that which we appreciate and the essence of others. You already have a sense of how to connect to each of your clients you are counseling as you listen to how they show up during your sessions. Through “open observation,” (being present with each person with a loving intent) you hold a connection where each of your clients will feel the space that invites them to be present. When a person is “lovingly seen” a great gift is offered that helps to create this safe space for clients to show up just as they are, while also engaging the observer’s intuitive senses. After the space is established, next extend loving encouragement by acknowledging something that you sense about them. This furthers to deepens the connection. An invisible connection supports the safe space and moves the shared space into a zone of potential. This is when magical occurrences can happen in this shared state. By catalyzing the connection through unattached observation a door to transformation can open. Oftentimes, it is subtle states that create the biggest opportunities for the emergence of change to occur. Notice how this instruction has little to do with giving you a labeled technique to deepen your intuition. It is more about noticing what you already have within as you show up in each given moment. Your state of observation combined with a passionate heart is what awakens intuitive senses to notice and perceive more right brain input. It is also useful to remember that we are all teaching each other all of the time. We are entangled in a web of love…which is the sameness that we all share where we can all freely interact with no harm. Calming touch is also a great way to help people center, while connecting through the eyes. Touch and eye contact can bring people to the present moment. Sometimes, if even for just a second, loving touch and eye contact can break a pattern to allow some type of useful reorganization. Sense how your compassionate heart and loving touch can connect with your eyes. Together they support you in filtering information from your intuitive senses (information shared between you and your client). So much is communicated and transferred through this gentle state of connection. These subtle and simple interactions that invite deeper awareness may support the lovely work and intent you have to help those who are experiencing these physically based challenges. You may also find through teaching others how to be present through loving intent and observation that they can also be a catalyst for creating healing space for themselves and others, too. Each day science is becoming more aware and proving the importance of conscious intention, perception, and the power of love. By seeking what is holistic and useful it offers a path to transform our reality and engage with our intuitive senses. Thank you for your lovely question. This entry was posted in Developing Intuition and tagged building intuition, consciousness, intuition, intuition in mental health, intuitive abilities, intuitive development, intuitive healing, intuitive listening, intution, learning intuition, loving intention, observation, power of love on August 9, 2010 by sanbreck. 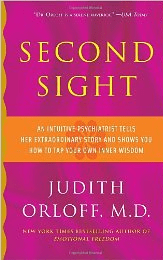 “To listen only to the mind and not the soul is insanity.” These are the words spoken by psychiatrist Judith Orloff and this theory is what her book Second Sight is all about; learning to listen to and trust intuition. As a student of traditional Western medicine Orloff learned first hand, from the perspective of a practitioner not a patient, about the serious hazards of Western medicine. Her quote says it all and addresses just how most often Western medicine indeed does treat the patient. Second Sight follows Orloff’s story from a young child with strong intuitions that were silenced by a scientific minded family. Then Orloff continues on sharing the process of the last decade “coming out of the closet” with her intuitive healing instincts. When any type of treatment focuses on only one part of the whole it is not optimal. In the case of Western medicine we silence the intuition and instinct with pharmaceuticals to “heal” the ills of patients. Doctors teach patients to ignore their bodies own vital clues and delay life saving treatments. Orloff thinks we can do better. In her 12 chapter, 384 page book, Second Sight, Orloff invites you to join her on her own personal journey of re-learning to trust her intuition. In the second half of Second Sight she teaches the reader how to develop and nurture their own intuition. Intuition is often written off, especially in scientific fields, as “silly” or “nonsense.” Orloff explains how she learned to dismiss the common criticism and use her intuition to improve her own life and the lives of her patients. We all have intuition, it can’t be taken away from us by others, or stolen in the dark of night, it only disappears when we choose to stop listening to it. But when we’re ready to listen to it again, it is there waiting for us. Orloff contends that using your intuition to guide you through life really makes life worth living. She explains by her own experiences of how much comfort, knowledge, and direction she has gained both personally and professionally by doing just that – following her intuition. Second Sight has a calming, gentle feeling that comes with reading it. I like how Orloff shares her own intimate life details with the reader freely and openly. She tells the reader of her own doubts and personal shortcomings. She even tells how she was ashamed of her own intuition and what it took to overcome those fears. In addition Second Sight teaches the reader how to look for signals from your own intuition. Orloff gives six ways to develop and grow your intuitive abilities to improve your life. From reading your own dreams with meanings to checking in with your body to find out if anything needs attention, Orloff offers easy ways to tap into your own intuition. She is an assistant professor of psychiatry at UCLA, too. You can feel her spirit come through in truth and wisdom in Second Sight. Orloff is brave to state her beliefs and continue to follow her own intuition in teaching both patients and physicians to use their intuitive senses in both their professional and personal lives. Orloff explains that it took her seven years to write Second Sight as she was in fear of many stigmas that would be attached to her in her highly scientific medical community. Bravo Judith Orloff for stating what so many feel and so many others know to be true! This entry was posted in Books, Developing Intuition and tagged building intuition, intuition, intuitive, intuitive abilities, intuitive healing, intuitive listening, intuitives, judith orloff md, learning intuition, second sight on August 2, 2010 by barbara_cronin.